Summary: Four teenagers on the same road in a world gone mad. Struggling to survive, clinging on to love and meaning wherever it can be found. THE DARK INSIDE is a stunning, cinematic thriller: 28 DAYS LATER meets THE ROAD. Review: If I'm brutally honest, this book didn't seem like it would be my kind of read. 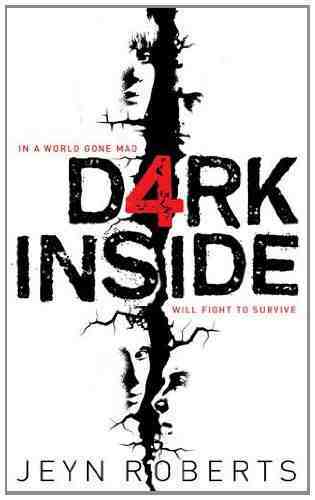 I'm so glad that I did give 'Dark Inside' a go as it was a truly amazing read. Each page had you desperate for more. For a debut novel, I think Jeyn Roberts is heading for a best seller. Never ever judge a book by its cover. 'Dark Inside' was an immensely intense read that will have you breathless and paranoid by anything and everything. The pace of this book is quick and exciting. All the characters in this novel are exciting and intriguing. I must say Clementine has to be my fave. I loved that during her grief and destruction she used telepathy to keep her sane.The downside to this read is that you get to an exciting cliffhanger, turn the page and it's back to someone else's story. So you're then excited to return to it. 'Dark Inside' is intense. Just when you think you've got the plot and you understand each individual persons own grief, Bam there's a twist that has you questioning everything.You cannot trust anyone, not even the people you think you can trust.The twists and turns in this book are immense. All I can say is trust no one! Not even the old man on crutches. If you're not a little paranoid then this book didn't work for you. Some people crumble under pressure. Others like Michael take charge of the situation. This book really made me think if I was in the worst imaginable accident or crisis could I trust my friends and loved ones to be there for me whole heartedly. Michael's optimism and leadership in times of need is inspiring.Have you ever thought of how you'd cope without communication? No mobile phones, no landlines, no internet and the only TV that works is on a loop.This story shows that some people leave when the going gets tough. What I also really enjoyed was the chapters marked 'NOTHING' as if from the inside of the head of the othersThe description in the build up to something dramatic is so amazing, as a reader you're pulled into their lives. Mason believed he wouldn't care after losing everyone close to him until he met Chickadee. Their story is heart warming. A captivating read from the very first page. Definitely one of the best books I've read this year. Dark Inside is a fantastic read, beyond worthy of my favorite shelf. What a debut! I seriously got scared at parts while I was reading it. This is probably not the most articulate or best reviews I've ever written. It's just that...my brain is kind of frazzled right now.